My fridge is like Ali Baba’s treasure. They are various left-overs, and many bits and pieces of things : herbs, cheese, sauces, condiments. One of the item is a large piece of Gorgonzola cheese. I love that cheese, but being lactose intolerant, I am slow to eat it. In my previous post, I gave a recipe for a crustless quiche. 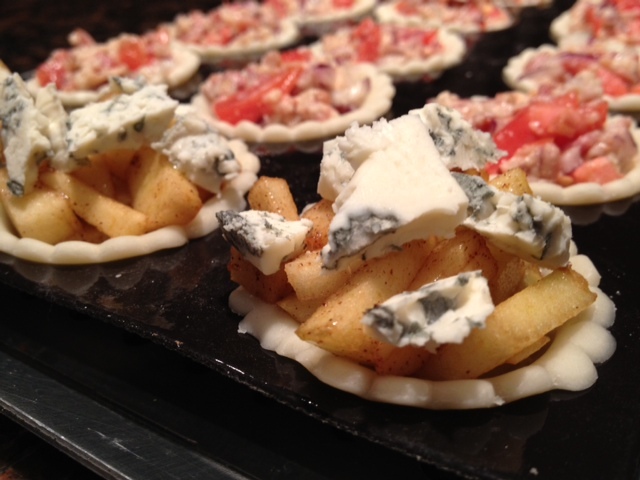 Since I had some pie crust left, diced apples and gorgonzola I thought it would make for a fun appetizer. And tasty it was!!! I love pear and gorgonzola, but apple and gorgonzola was great also. 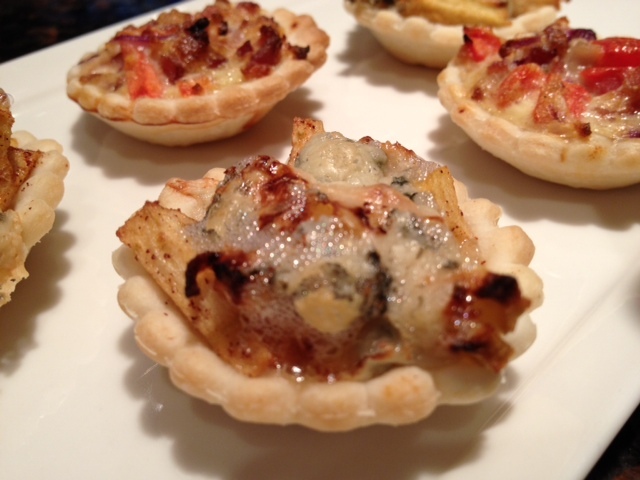 For 30 small tartlets: 1 pack of pie crust ( 2 pie crusts), 2 cups of very very small diced apples, 1/2 cup of gorgonzola crumbled, 1/2 tsp of salt, and 1/4 tsp of freshly ground pepper, 1/4 tsp of cinnamon. On the roulpat, roll out your dough and with the 2″ cutter, cut out small pie crusts. Place those pie crusts on each opening of the mini tartlet tray. Using the pie shaper, push the dough down. Then use a fork to perforate the dough so that bubbles will not occur. In a large bowl, add the apples and sprinkle the salt and pepper and the cinnamon. Mix well and spoon 1/2 tsp of the apple mixture in all the little pies. 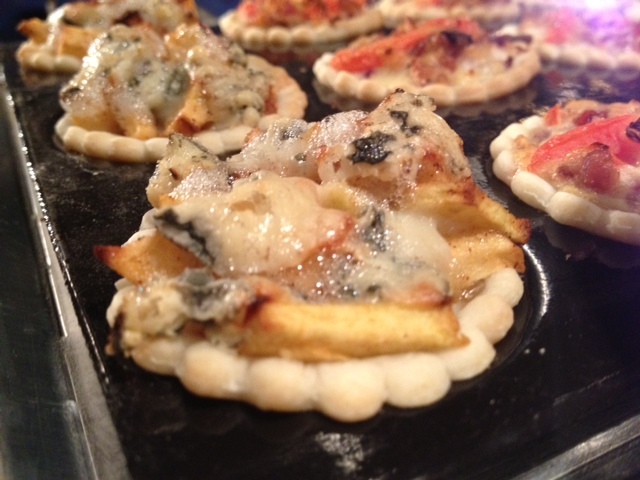 Sprinkle some gorgonzola on top of the apples and cook for 13 minutes in a warm oven at 375. C”est tout!! !